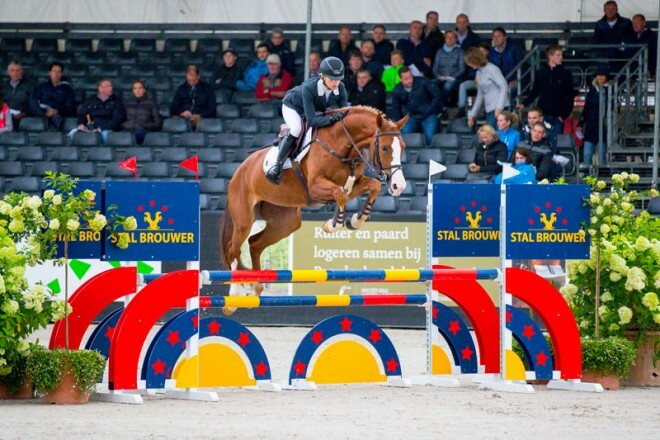 Dutch Sport Horse Sales proudly presents this addition (wildcard) to the 2017 auction collection: four-year-old Idagonda, the winner of the Blom Cup at the KWPN Championships. As a result, this Zirocco Blue daughter is the second Dutch Champion in the 2017 DSHS collection, after the Indoctro son Gloed. Under the saddle of Nicole Mestrom, the light-footed Zirocco Blue daughter Idagonda earned an 8.6 for jumping in the final and received praise as a textbook example of a modern jumper. Her sire Zirocco Blue provides the necessary scope, while Corland and Quidam de Revel also add jumping talent. In addition, her dam Degonda is a full-sister to the international Grand Prix show jumper Wegonda. Idagonda stands out with her athletic talent, excellent rideability and intelligence at the jump. All in all, the Dutch Champion Idagonda has a wonderful future ahead of her.